I am at An Event Apart today, and An Event Apart are also the sponsor of the newsletter this week. Big thanks to them. Yesterday I gave my presentation Graduating to Grid for the last time. In the email this week we have Flexbox, Grid, Shapes and button styling. In the final article in my Flexbox series for Smashing Magazine, I think about the use cases for Flexbox over other layout methods. Using CSS Grid to create sideways scrolling containers. An interesting breakdown of the difficulties of styling the button element. I presented my Graduating to Grid talk for the last time here in Orlando. For schedule reasons this talk will be filmed twice, the first time was the very first time that I gave it in Denver at the end of 2017. You can watch that version here. On my way between FITC Web Unleashed in Toronto and An Event Apart in Orlando I had some thoughts about the way people talk about CSS, so I put them on my blog. Fun article listing a whole stack of shapes you can make using pseudo-elements. I then had fun playing around with these shapes and the CSS Shapes spec. You told us you love our Special Edition conferences, featuring 3 days of great speakers—17 of them, 5 more than our traditional events. We heard you! 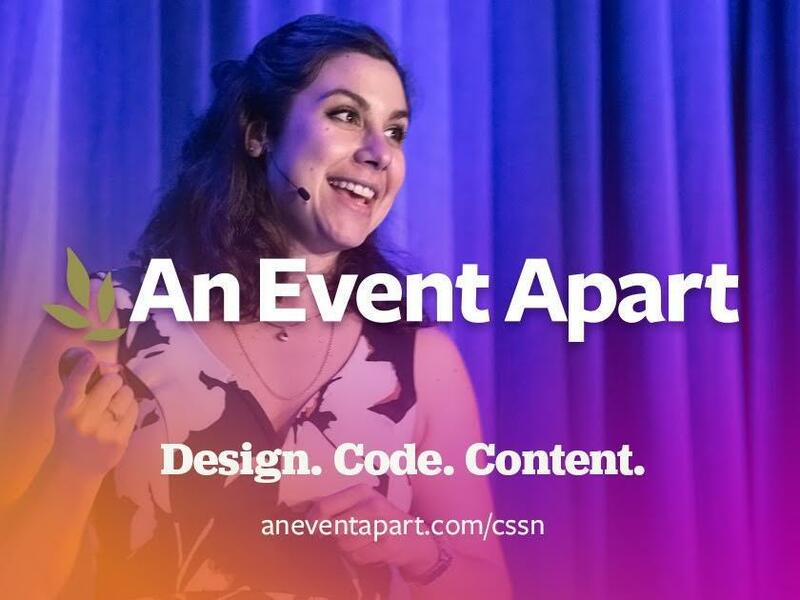 New for 2019, every AEA conference is a special edition. From now on, 17-speaker extravaganzas are how we roll. Take home hands-on, hard-won lessons and insights taught by front-end & UX leaders like Rachel Andrew, Jen Simmons, Brad Frost, Val Head, Dan Mall, Sarah Drasner, Trent Walton, Sarah Parmenter, Mina Markham, Chris Coyier, Sara Soueidan, Derek Featherstone, Aaron Gustafson, Aarron Walter, Dave Rupert, Gerry McGovern, Kate O’Neill, Laura Martini, Luke Wroblewski, Scott Jehl, Una Kravets, Margot Bloomstein, Jason Grigsby, Eric Meyer, Jeffrey Zeldman, & more! Learn the latest on all the trends affecting your work, from the pioneers who created them. And at AEA, you don’t just learn from the best, you can also interact with them. So come, be part of our best year yet! CSS Layout News readers save $100 off any two or three days with code AEACSSN.